Ah, just look at this lovely car, in a lovely place in the sunshine. 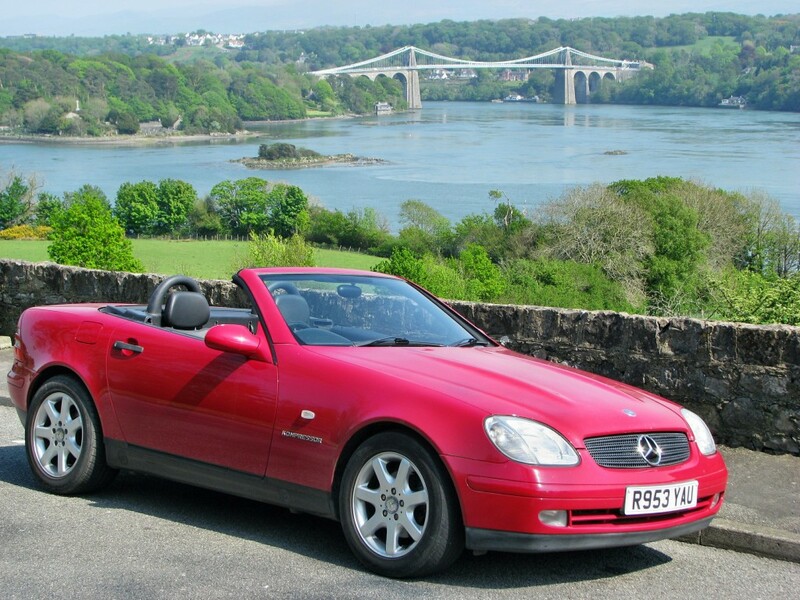 Well this picture was taken getting on for 6 years ago, soon after I bought my SLK, back in June 2013. The years have flown by, and I could easily drive the car to the same spot (near the Menai Suspension Bridge on Anglesey if you didn't know) and take an almost identical photo today. Well not today, it's snowing, but you know what I mean. However, if you walked a little close to the car then blemishes would begin to show up. And when I say blemishes, I mean that as a result of the top lacquer coat deciding that it no longer wanted to join in the fun of car ownership, that lovely red colour is now a memory, to be replaced by either dull and lifeless panels, or large areas that are going white, notably the bonnet, roof and boot lid. This is rather a shame, but I have learned it's not that unusual on red cars. Maybe that's why so many SLKs are silver. It's not a complete disaster, because in fact there's very little rust, apart from the normal front wings that all SLKs seem to suffer from. So a bit of effort and a re-spray would put things right. Mechanically it's in fine form, it's not yet reached 60,000 miles on the clock, a mere stripling in terms of distance covered, but this year it will reach an age milestone, in July it will be 21 years old. In fact it drives beautifully. Much better top down (I admit it is a tad rattly top up) I enjoy every moment behind the wheel. I never thought I'd take to an auto box, but frankly my recent decision to buy a 6 gear day-to-day car has been thrown into doubt - I guess you know you're getting old when all that thrashing about through gears starts to get on your nerves. It's bliss to just cruise along and let the car do the work. But that doesn't mean it's not fast, it is. The 2.3 litre supercharged engine is a beauty, smooth and powerful. It has got to shift all the additional weight of roof gubbins around, but progress is rapid if required - though I admit I tend to just cruise these days. Another old man comment, the heater is brilliant. The car has been remarkably reliable, it hasn't let me down once. Okay, things have occasionally gone a bit wrong, but I've never had to call out the RAC to get me home. By the way, the RAC have produced their annual report on motoring, this year (2019) celebrating 30 years! You can see it here. So, you might have been wondering why I'm writing this article. Well - I think I need to call time on ownership of this car. I think it's got to go. I've had my fun, and I'm not sure I really want to spend any more time (and indeed money) on it. So, despite the fact that I love it (well I love driving it) I'd like to sell it. If you are interested in owning the car please contact me. I think I've been candid about it, and there are some links below where you can learn more about it. It's old, the paint is falling off, but it all works - notably the superb roof - you could do worse for a summer run-about. Email me here. The first from 2013 post is here and the second post in 2015 is here. And I had a mad idea I could make web sites for people's cars and sell them, but it turned out only I thought that idea would fly - so there's a test site I made for myself here, it contains all sorts of info on the car, and a copy of the original owner manuals.